Limerick's Tom Morrissey celebrates after scoring a goal in front of Gearoid McInerney of Galway during the All-Ireland SHC final at Croke Park. 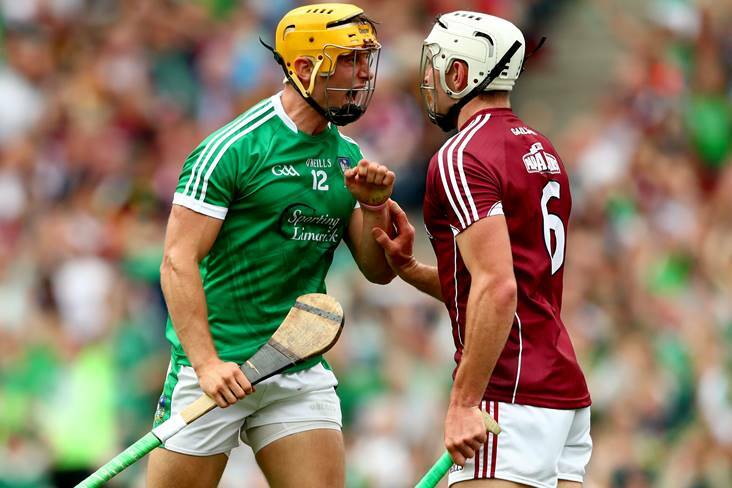 It was the biggest day in the hurling calendar as holders Galway and Limerick collided in the All-Ireland SHC final at Croke Park. The Tribesmen were bidding for their sixth title, having bridged a 29-year gap by defeating Waterford in last year's decider. The Treaty County started the day in fourth on the all-time Roll of Honour with seven All-Ireland wins to their credit, but they hadn't claimed the Liam MacCarthy Cup since 1973. This had the makings of a wonderful contest as the two best hurling teams in the world went head to head (3:30). As curtain-raiser, Galway met Kilkenny in the All-Ireland minor hurling championship final (1pm). The westerners were defending champions again, while the Black & Amber last captured the Irish Press Cup in 2014.